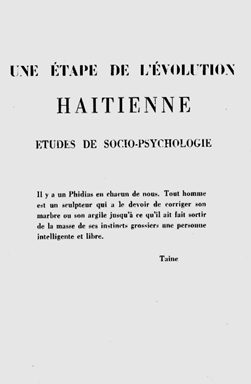 An excerpt from Haitian historian André Adam’s Une crise haïtienne, 1867-1869: Sylvain Salnave (1982). Below, Adam explains how Salnave initially overcome his rivals by recruiting "piquets," peasant soldiers. Nevertheless, Haiti soon broke into three republics, one ruled by Salnave, the others led by Michel Domingue and Nissage Saget. The civil war—a lot of it fought aboard American mercenary ships—ended when Salnave was captured en route to the Dominican border. Despite the state’s combativeness and [help from] the women of Bel-Air [who supported Salnave], it was unable to loosen the [insurgent’s] grip on the city. Salnave decided to take advice of his minister, Numa Rigaud, who, according to [Anténor] Firmin, "was acquainted with [Jean-Jacques] Accau’s old followers" [and was able to] call upon the peasants in the west and the south: the piquets. The political struggle was thus transformed into a war over social issues. The peasant leaders mobilized the peasantry in favor of Salnave. On 19 September 1868, Nissage Saget founded the Septentrional Republic. It [stretched] as far south as Archaie and included the entire north, except Cap-Haitien, the entire north-west, except Port-de-Paix and Môle St. Nicolas, and the entire Artibonite, except Gonaïves. 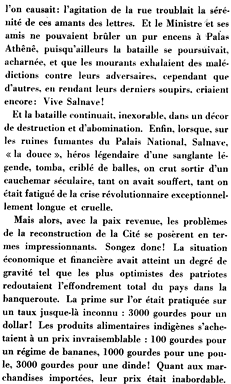 On 21 September 1868, Michel Domingue organized the Méridional Republic, whose geographic borders included all the cities in the south, except the mountains [whose inhabitants] supported Salnave. 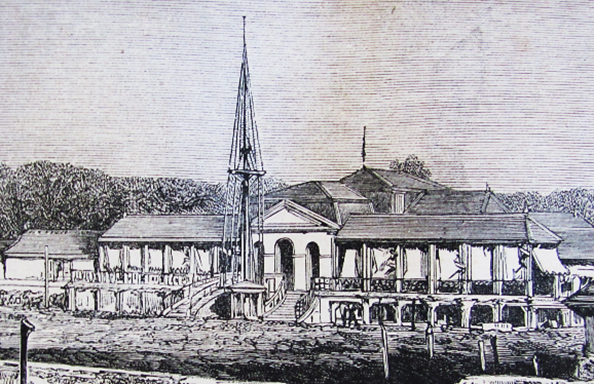 The city of Jacmel also joined the Méridional Republic, whose capital was les Cayes. With its navy, the [Septentrional Republic] had taken the north, the north-west, and the Artibonite. Its leaders who included General Brice and Boisrond Canal met in St. Marc to develop their final strategy. For a second time the capital was attacked. But the result was not the same as before. The rebels [of the Septentrional Republic] commandeered a powerful gunboat, "the Terror," on the night of 17 December 1869. It gave them [the upper hand] and [Salnave’s] collapse was complete. [Struck by the Terrror’s guns] the national palace exploded.